Four University of Jordan (UJ) faculty members received UJ's honoring shields for distinguished accomplishments that led to winning local and international prizes. Dr. Abeer Dababneh, Director of the Center for Women's Studies, Dr. Khawla Abu Hammour, Director of the Department of Pharmacy, Dr. Diala Al-Tarawneh Assistant Director of the Innovation and Entrepreneurship Centre, and Dr. Sana Al-Shaalan from the Language Center were acknowledged by UJ President Prof. Abdull Karim Al Qudah for their accomplishments. 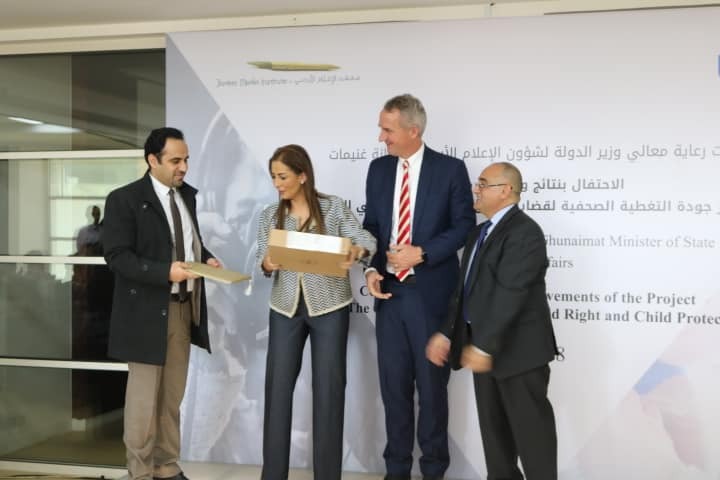 "UJ is committed to supporting and encouraging distinguished staff and students," Al Qudah said, adding that such commitment arises out of the principle that human capacity is the key pillar of the advancement of the University. The Director of the Center for Women's Studies, Dr. Abeer Dababneh, was granted the award of the German - Arab Woman Business Leaders (GAWBL) Summit-2018 for the “I Am Here” women's economic empowerment initiative which is co-implemented by the Center. Dr. Khawla Abu Hammour was awarded the King Abdullah II Award for Excellence, the highest level of recognition of quality performance in Jordan. Dr. Diala Al-Tarawneh received the 2018 Tamayouz Women in Architecture and Construction Award. Whereas Dr. Sana Al Shaalan has been awarded the 2018 Katara Prize for Arabic Novel in its fourth session. Powered By Information Technology Center - The University of Jordan © Copyright 2018. All Right Reserved.